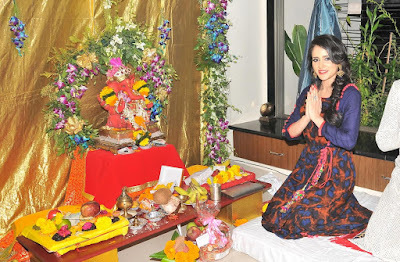 Wishing love, peace and happiness to everyone, Shweta Khanduri says “Ganesh Utsav is one of my favorite and the most spectacular festival, honoring Lord Ganesha. Celebrations are always a welcome part of Ganesh Chaturthi. The best part is that my home becomes very lively with the devotional songs, dances and drum beats being a part of the rituals as part of the festivity in my house. Loud music, traffic jams but no complaints as the Lord makes way into our hearts once again. It's a tradition that I cannot do without."